The hospice, which works to ensure people are informed, equipped and able to live with dying, death and grief, announced the official total for its 2018 Girls Night Out walk this week as £226,643, and there is still sponsorship and Gift Aid money to come in. The figure of £226,643 is made-up of the money walkers raised as well as generous support and sponsorship from local businesses including main sponsor J M Finn, who will also be the event’s main sponsor this year. 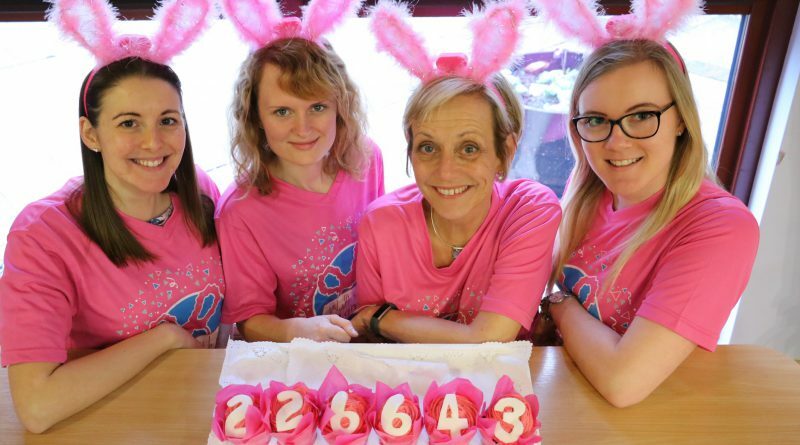 The efforts of 2018’s Girls Night Out walkers, some 2,000 who proudly donned their flashing bunny ears while completing either 11.2 or six miles around a moonlit Bury on September 8, will help the hospice provide a range of support services in the community and specialist care on its ward. Pictured above is the hospice fundraising team celebrating the Girls Night Out, sponsored by local wealth management firm J M Finn, official total of £226,643.